Visual Studio Code>Programming Languages>Stata EnhancedNew to Visual Studio Code? Get it now. Stata syntax highlighting in Visual Studio Code, built from the ground up. Code snippet from Gtools, a faster implementation of Stata's collapse and egen using C plugins. Shown with the Material theme. Comments, more accurately than Stata's Do-file Editor. 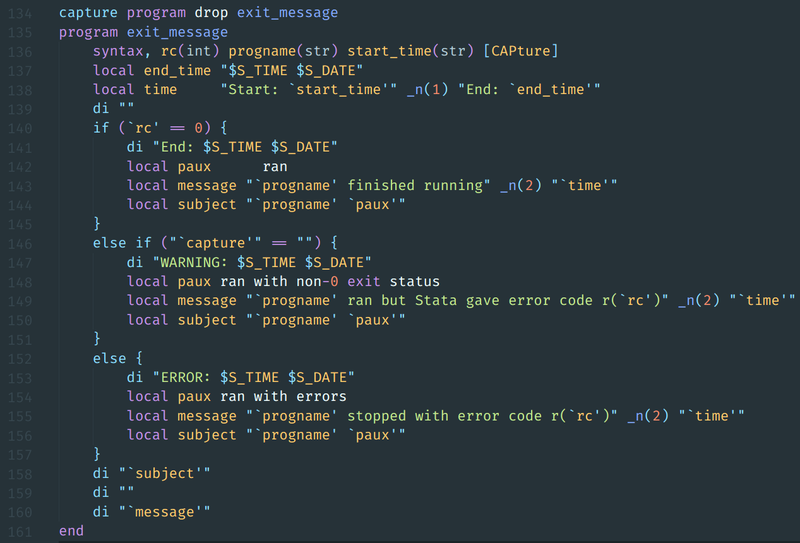 Colors both the limited syntax provided through the regexr() and regexm() functions, as well as the vastly expanded regex syntax provided in Stata 14 and 15 through the ustrregexm(), ustrregexrf(), and ustrregexra() functions. Dynamic Markdown and LaTeX documents. Instructions below. Works with unicode identifiers. Use unicode anywhere it's legal Stata syntax. Alerts you if your variable name is illegal, i.e. if your variable name is more than 32 chars, starts with a number, or is a reserved name. Support for programming ligatures for all valid Stata syntax for fonts that support them, like the Fira Code font. Some themes may not color all parts of the syntax. This package doesn't have the capabilities to run your code in Stata. If you're using Linux, you can use my scripts with the Autokey automation utility to quickly run selections of your files in a graphical session of Stata. You might also be interested in trying to port Atom's stata-exec package. Stata 15 brought new features for working with dynamic documents. The dyndoc command lets you write in Markdown and converts your file and code to HTML for viewing in a web browser. It also added the dyntext command, which fills in Stata output for any text file, without touching the text itself. This lets you then use third-party document generators like Pandoc and LaTeX to generate documents. 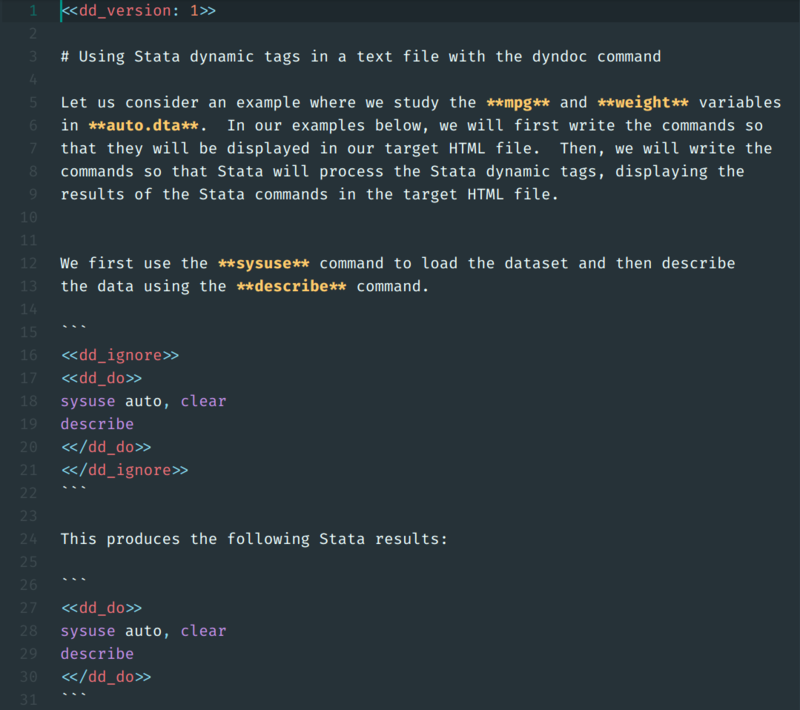 This package now provides syntax highlighting for Stata code written inside Stata's dynamic tags for Markdown and LaTeX documents. By default, this package's Markdown and LaTeX syntax highlighting will be applied for files ending in .domd and .dotex respectively. The Markdown All in One and LaTeX Workshop packages must be installed for the highlighting to work. If you name your file with a different extension, you can manually set the highlighting by clicking on the "Plain Text" button on the bottom right of the screen (or by pressing CTRL+SHIFT+L) and then selecting Stata Dyndoc (Markdown) or Stata Dyndoc (LaTeX) from the drop-down menu. An example of the PDF output of using dyntext and Pandoc is in the examples folder: dyntext.pdf. on the command line using Pandoc. The file dyntext.dotex is a proof-of-concept and should compile with LaTeX but the output is not shown here.